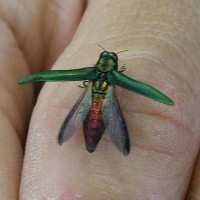 The Emerald Ash Borer (EAB) is a shiny emerald green beetle that kills ash trees. Ash is found throughout forests and woodlots in the Credit River watershed and is commonly used as a street or landscape tree. EAB is an invasive pest, native to Asia and was first noticed in North America in 2002, in the Detroit-Windsor area. EAB feed on ash tree foliage. EAB larvae feed just beneath the bark of ash trees and disrupt the movement of water and nutrients. Once signs and symptoms of infestation develop the tree is usually in irreversible decline. Once dead, ash trees tend to fall apart, dropping bark and dead branches, within two years. This pest continues to spread north through Ontario by flying from ash tree to ash tree. However, the rapid, large-scale spread of EAB is facilitated by transporting firewood, nursery stock and logs. As such, movement and treatment of ash materials is now regulated in many areas of the province. EAB has already killed millions of trees but early detection can slow its spread and damage.